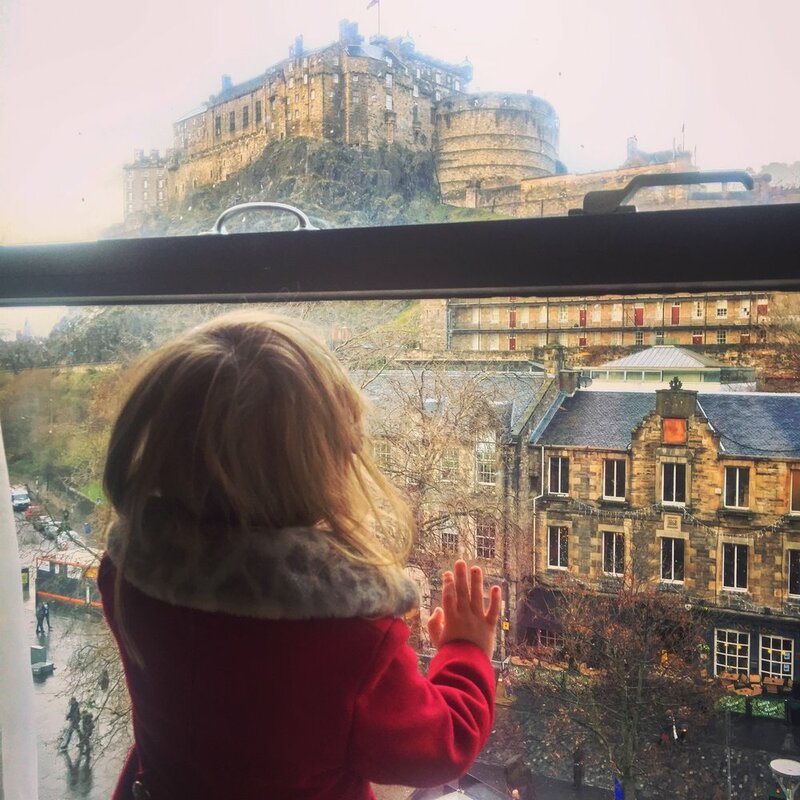 Over the years, a family tradition of ours would be to catch the 7:30 a.m. train from Durham (my home town) to Edinburgh, on the first Saturday of December. I guess once it’s December you’re allowed to feel Christmassy. Together with my Mum, Dad and brother we have been joined by various plus ones over the years. Boyfriends, girlfriends, family friends... the number is usually four or five but has been known to swell to eight. We would arrive at Waverley station after a sunny ride (it was always a crisp sunny day! ), cruising up the east coast main line and would head straight to the restaurant at the top of Jenners for a hearty Scottish fry up before going our separate ways to hit the shops. We would do our own thing, then reconvene at NBs (the bar at The Balmoral). These days it’s quite a swanky looking bar called Brasserie Prince, but back then, NB’s was unstuffy and cozy, and had just the right amount of tartan drapes. We would arrive, laden down with shopping bags and freezing cold hands and noses. Somehow we always managed to find a table, and would plonk down, surrounded by shopping bags, hats and coats, with just enough time for a glass of wine before catching the 7 p.m. train home. Of course we missed some years, for one reason or another, but I will always associate Edinburgh with Christmas. 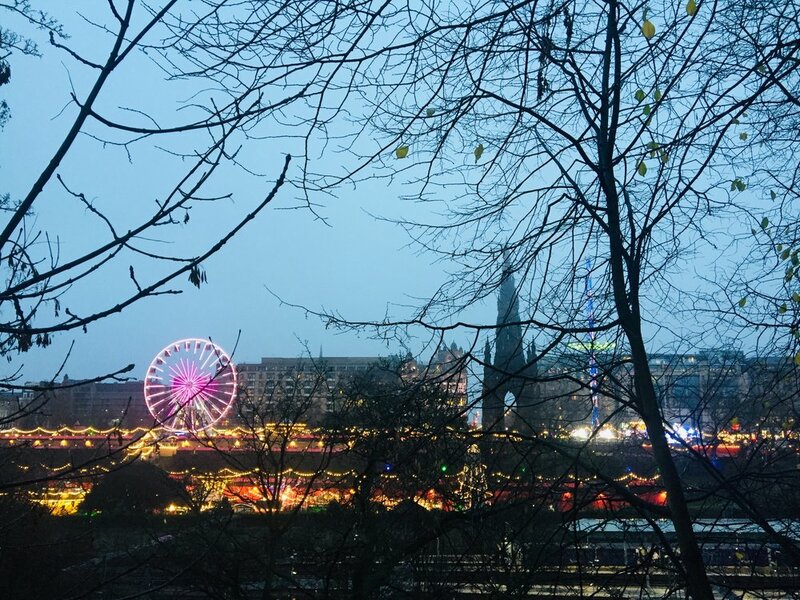 And nowhere does Christmas quite like Edinburgh. So many fairy lights! And even when the weather is bad, the mists shrouding the castle just seem to make it look more mystical rather than miserable. This year is a little different. After a personally tough end to the year for my family, this trip is a much needed girl's road trip. Just me, my Mum and my four year old daughter Rosa and we're staying the night. How exciting. Girls on tour! After a clumsy start due to a faulty train, we finally roll into Waverley Station, drop the bags at the hotel and we're off to explore the Christmas markets in Princes Street Gardens. One of the busiest and most jovial areas was the bar of course. £3.50 for Gluhwein! You also need to leave a £2 deposit for your snazzy Christmas mug, which is refundable (if you remember to return it). There are some stalls (think Christmas ornaments, candy floss and German sausages, plus the bar of course) upstairs before you descend down into the Gardens. In fact there is a good vantage point up here. Great for snapping a pic to capture the whole wintry scene. It goes without saying that this (the first Saturday in December) is one of the busiest Saturdays of the year to visit but who cares when there is a Santa train and a Christmas tree maze! This is a tightly packed Christmas market with a sort of one way system in place. I did see some poor parents huffing and puffing, carrying buggies up and down the steps into the Gardens (and there are quite a lot of steps) however there is an accessible route at the East end of the gardens. If you want all the feels of a Christmas market you won't be disappointed. Wafts of gluhwein, waffles, and bratwurst linger in the air, plus the odd group of giggly girls and tired parents with wide eyed children. Of course my daughter loved it, although she did get a little grumpy at the slow walking pace (and not been quite tall enough to see into all of the stalls without me picking her up) but when we reached the Santa train all was forgiven. It is 10 minutes of pure Christmassy joy. Trundling past the fir tree maze, through an exciting misty tunnel, then a quick whizz through the fairground. Be prepared to inch along slowly, and accept that you will pay slightly over the odds for, well, everything and you'll have a great time. Despite the crowds we still had a warm and fuzzy feeling afterwards. We stayed at The Apex Hotel in The Grassmarket. Be careful when you book; there are two Apex Hotels just a few doors away from each other! The one with the best views is the one slightly further down Grassmarket (no 31-35). Ask for a room with a view of the castle. Rosa was captivated! Another good tip is the view from The Mound (just as you cross in to the Old Town behind the markets). There are wonderful views here. Some great photo opportunities. I hope you have a wonderful time in Edinburgh!